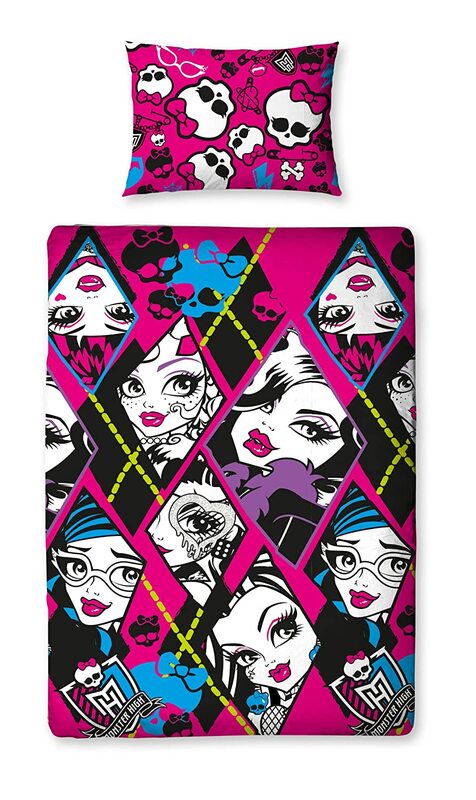 Find ideas and merchandise featuring characters and designs to use in a Monster High bedroom. 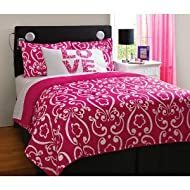 Everything from Monster High bedding to ideas for decorating the walls is here on these pages for you to choose from. Combine several elements into one room or pick out just a few to add to a current decor. Monster High has been a huge hit for Mattel in its efforts to capture girls attention after they grown out of Barbie. The students at Monster High are the teen children of classic monsters such as Frankenstein, The Mummy, Medusa and more. The high style and fashion sense of the Monster High characters make them a natural for decorating a tween girl's bedroom. The monster factor makes them a little edgy, while still not being too grown up. Color scheme in general tends to be heavy on the pink and black and highly graphical in style. In fact, black is a color all the characters seem to share, so it's a good one to keep in mind as part of the basic design of the room. 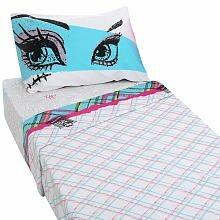 For the longest time, we only had one style of Monster High bedding released in the US, although there were pictures of others floating around in the ether. 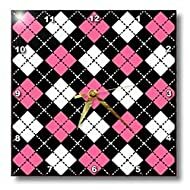 Recently, there have been a few new designs released, still rocking the black and hot pink, but incorporating more of the argyle and other elements. 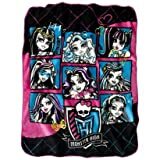 You'll notice all of these come in strong colors and highly designed graphics, which are consistent with the Monster High design ethos. 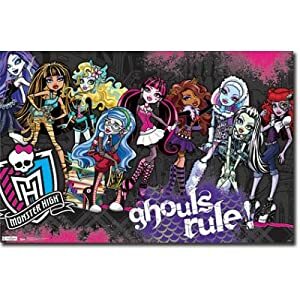 Mattel Monster High "Ghouls Rule"
Options available in Europe. Occasionally available on eBay in the US. Monster High 4 Pc Twin Comforter & Twin Sheet Set NEW! 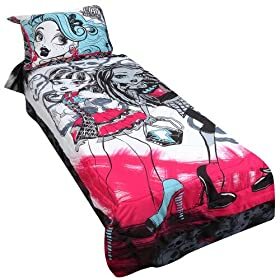 Monster High Micro Raschel Throw 50" x 60"
If you can't find a Monster High bedding set that works for you, consider some options that will work with the theme, while not being Monster High specific. The general logo for the Monster High brand is pink, black and a splash of turquoise blue. 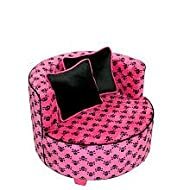 And just about all the decor items you'll find are heavy on the pink and black. So you might consider just any comforter your daughter likes as long as it uses those two colors. The Madison set pictured here has the upside of not being overly black, which you might not want for a younger child. One pattern you see a lot as well on Monster High merchandise is pink argyle - sometimes pink and black, sometimes just pink. I find argyle bedding in general to be difficult to find, so that might be a pattern to consider for accessories. 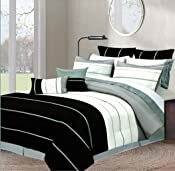 The one color all the characters share is black, so you could work with any comforter that has that as its base color. I like this plaid set pictured here because it looks a lot like the plaid background used in Monster High graphics. And has just about all the character colors in those stripes - green, aqua, white, pink. 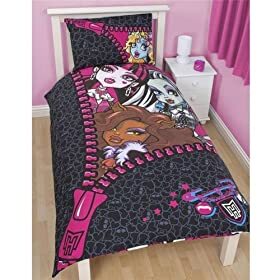 If your daughter has one specific character she likes best of all, this might be a great way to give her the room she wants even if you can't find Monster High bedding. For example, Frankie Stein's favorite color is black and white stripes. (I know! Not really a color!) Which is simple enough to fine. And I really liked the set pictured here because not only is it black and white stripes, it includes a bit of green that matches Frankie's skin tone as well. Bonus! Lots of pink and black here with a coffin version of a canopy bed. 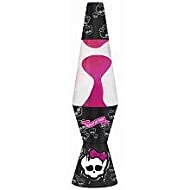 Generally, what you'll find that is Monster High specific is black and pink (frequently argyle) and with the skull from the school logo. Supplement items with others featuring the same color scheme or argyle print. And fortunately, there are tons of choices in bedroom decor items with skulls sporting pink bows. One great example being the hot pink and skulls chair pictured here. Take care as you add accessories that you aren't overdoing the patterns. 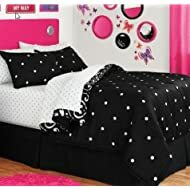 Plain black and hot pink items will work nicely too and have the added advantage of still being useful after your daughter wants to change room themes. If your daughter has several of the Monster High dolls, consider creating a display case for them. Doubles as storage for at least some of her toys and as decor for the room theme. Sakar Monster High Message Board - Sakar 81248. Adding Monster High designs to the walls is probably the quickest and easiest way to get the theme going. After all, you don't need everything else when you have a Monster High poster to hang! Consider using wall decals not just on the walls, but also on furniture and other items (a trash can comes to mind) to add more of the Monster High theme around the room. What Does Your Monster High Bedroom Look Like? 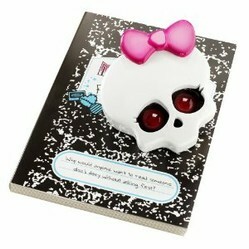 One of my cousins has a number of these items, they can't get enough of Monster High. Great collection you've got here. Thank you so much! This is just what I needed to get my daughters new MH room started. You're awesome!